I sing in a choral group. In order to perform with this group, I need appropriate concert attire. I’ve been singing with this group for twenty years and I’ve been wearing the same gown for most of those years. I love that gown, but I realized this past week that it was time to admit that I am not the same size I was twenty years ago. I had a concert on Sunday, so I pushed myself out the door Saturday morning to go in search of new attire. I know what you’re thinking, but honestly, no, I couldn’t make myself start this search any earlier than the day before the concert. I knew the guidelines. It had to be black. It had to be floor-length. It had to have sleeves. It couldn’t have any other colors on it, or rhinestones or sequins. It needed to be tasteful and not distracting – in other words, no plunging necklines, no cut-outs, and no thigh-high slits in the back or sides. It could be a skirt and top, or it could even be palazzo pants and a top, as long as they were formal. I knew I wasn’t going to find tasteful formal attire in any store that wasn’t at least pretending to be upscale, so I started, of course, at Burlington Coat Factory. You didn’t think I was going to pay retail, did you? Burlington did have a few formals but the only black ones were covered in huge fake gems or sparkly silver trim. No luck there, so I moved on to T. J. Maxx. T. J. Maxx had come through for me when I needed clothes for jury duty, so I had high hopes when I went in there. They did have formals. They even had black formals. I found one pretty dress and another jumpsuit that I hoped might qualify as palazzo pants, and I took them to the fitting room. I tried the dress first. It was smaller than my normal size, but it looked big, so I hoped for some vanity sizing and I was not disappointed. I put it on and, oh, my goodness – it fit! I looked in the mirror. I put the dress back on its hanger and tried the jumpsuit. It fit, but it did not look like palazzo pants. It just looked like pants. I’ve seen other ladies in the group bend this rule a bit, but I just couldn’t do it. I was the original chairperson of the attire committee; I had to set a good example. For the record, I did not volunteer to be the chairperson. I was drafted. I did volunteer to be on the committee, but that was just to make sure nobody tried to put us all into puffed sleeves and sweetheart necklines. I’d seen it happen in my daughter’s high school chorus and, believe me, not even the few girls with perfect figures looked good in those dresses. God help the big-boned or flat-chested. But I digress. I was shopping for a new gown and I was not finding it at Burlington or T. J. Maxx. I was forced to go to the mall. My nearest mall has four big anchor stores. Surely one of them would have something that would work. I parked at Sears and went inside. They had formals but they were aimed at teenagers and covered in bling. I headed for Dillards. No luck there, either. Belk had more formal attire than any other store in the mall, but none of it was simple and elegant and black. That left J. C. Penney, which happened to be having a huge clearance sale. 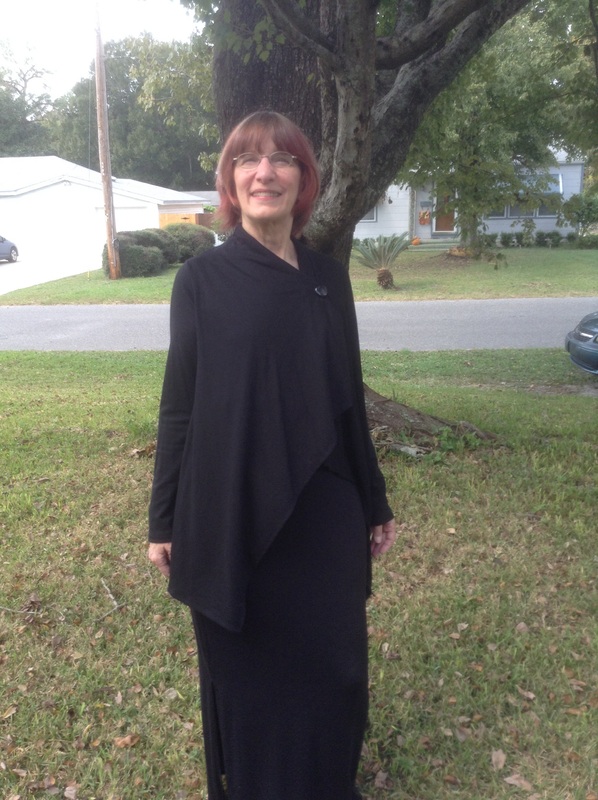 I was desperate at this point, so when I found a straight, black skirt that would go with the top I had bought for jury duty, I figured I would find a way to make it work. I ended up having to replace a big brown button on the top (oops! I forgot about that) but I did make it work. I know. I looked like a short, red-haired Bea Arthur…but I could breathe! This entry was posted in Uncategorized and tagged chorale, chorus, formal attire, shopping, singing on October 28, 2015 by releaf1954. The bills have arrived. I have piles of receipts I am matching up to my credit card statements. Every time I check one off, a memory is triggered that makes me say, “Worth it!” The gas to get us out of Florida? Worth it. Camping fees at our first stop in Mississippi? Worth it. The gas to get us out of Mississippi? Worth it. Admission to the Very Large Array? Worth it. Postcards for the grandchildren? Worth it. More gas, more admissions, more postcards? All worth it. It’s time to pay the piper and I am grateful that I got to dance. There is now scientific evidence that spending money on experiences will make us happier than spending it on stuff. I don’t have a lot to show for the money we spent on our trip out West – a few refrigerator magnets and a lot of photographs – but I have memories that will stay with me for the rest of my life. I had reached an age (sixty-one, if you’re counting) when I was starting to think I might not have any more adventures. I thought I might just sit in my comfy chair and play iPad games or have virtual adventures on the Xbox 360 for the rest of my life, but I was wrong. Amazingly, delightfully wrong. I went out into America, and I saw beautiful things. I saw things I had dreamed of seeing all my life and I saw things I had never even imagined. I hiked legendary trails and I hiked trails so obscure we only knew about them because there’s an internet and a search engine to help find them. I climbed a scary ladder and felt stronger and braver than I’ve felt since my last child was born. 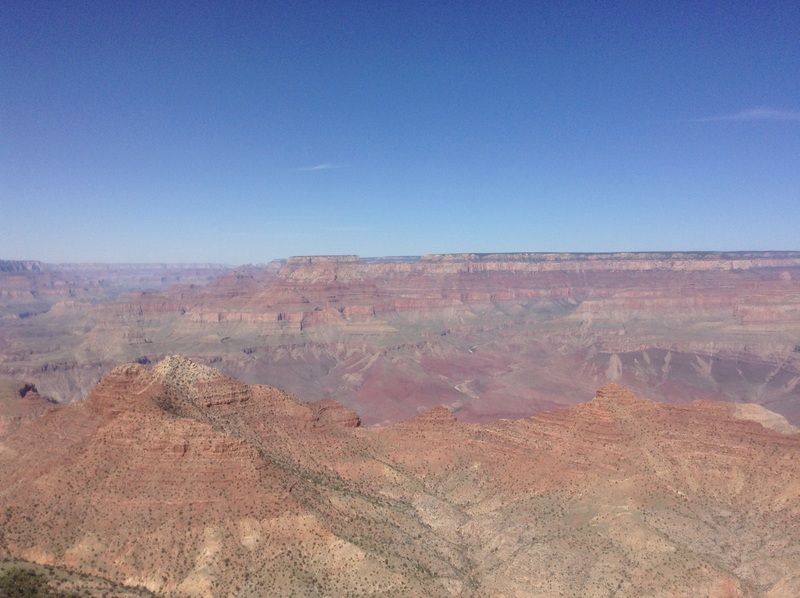 I used to say, “I want to see the Grand Canyon before I die.” Well, I’ve seen it now, but I’m not done yet. I have a list. I want to see Yosemite. I want to see Yellowstone. I want to see giant sequoias and I want to see the Aurora Borealis. The world is full of beautiful things and I want to see as many of them as I can. We saved for this trip, so I can pay these bills once I get them in order. We will do that, and then we will start saving for the next trip. Sometimes, I look at credit card statements and wonder what in the world I was thinking when I charged all that stuff. This time, I know exactly what I was thinking. This entry was posted in Uncategorized and tagged adventures, bucket list, grand canyon, hiking, vacation on October 21, 2015 by releaf1954. This will be a quick post. I can’t believe my husband managed to save some days off so we could do a little leaf-peeping this year. Our trip out West would have been well worth sacrificing the usual North Carolina Fall Color tour, but here we are, filling our hearts with even more beauty. We are camping on our own little piece of land and admiring our own golden trees. Later, will will drive the Blue Ridge Parkway, our most familiar National Park. It might just be our favorite. It’s certainly the one we know best. I hope we get to know more and more National Parks in the years ahead, but I will always be grateful for this one. In Autumn, it feels like home. 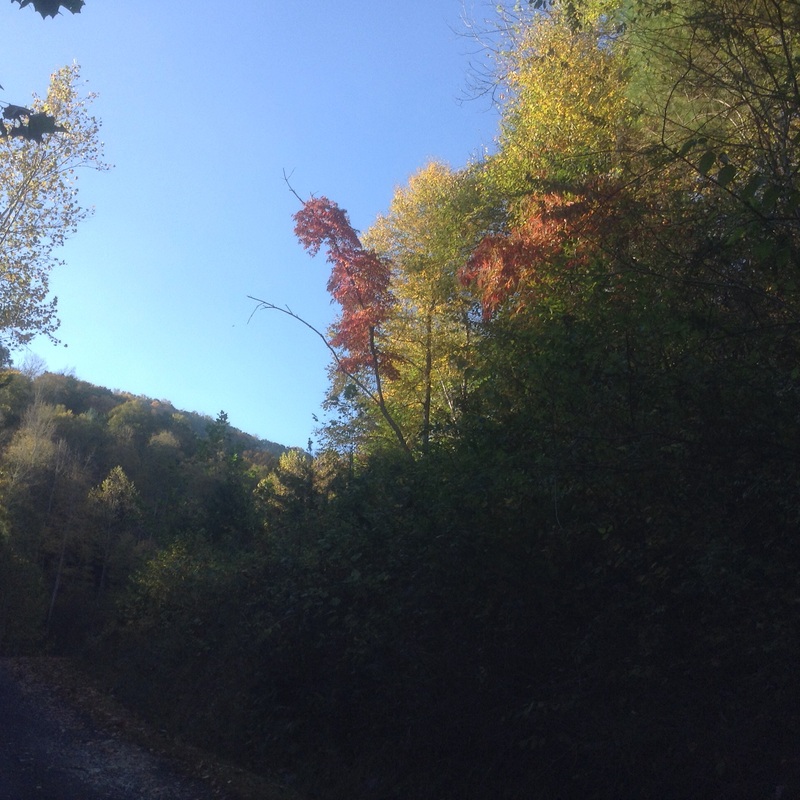 This entry was posted in Uncategorized and tagged Blue Ridge Parkway, camping, North Carolina, The little blue teardrop trailer on October 14, 2015 by releaf1954. We all complain about taxes. I’m sure plenty of mine are spent on things I would rather not support, like war and the salaries of congresspeople who were already millionaires before they got elected. I don’t get to choose, but if I did, I would sure send a big part of my average tax dollar to the National Park Service. I spent some time recently visiting national parks and I have to say, those places gave me quite a return on my investment. The Grand Canyon was more magical than Disney World and a $30.00 ticket gave us access to the park for a week. There are buses that run from one point to another along the South Rim, every ten or fifteen minutes all day long. We could jump off one at a point of interest along the route and catch another as soon as we finishing taking pictures and saying, “Wow!” We didn’t have to pay for the bus rides. They were included in the entry fee. It felt a little like a theme park, in that there were shops and restaurants and lodges and souvenirs and people speaking every language under the sun, but the main attraction – the thing we all came to see – was absolutely real. No fiberglass trees, no CGI; it’s an actual natural wonder and it’s HUGE! I gasped every time I saw it and I never got over it. The Grand Canyon alone would have justified the two-week road trip, but we also saw a number of other national parks and they were all gasp-worthy. 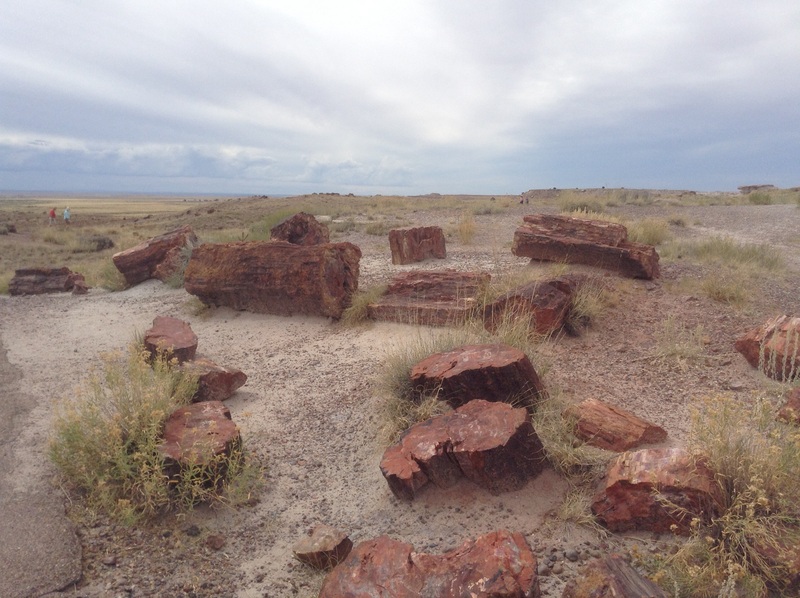 The Petrified Forest National Park went on for miles and miles and included the Painted Desert. 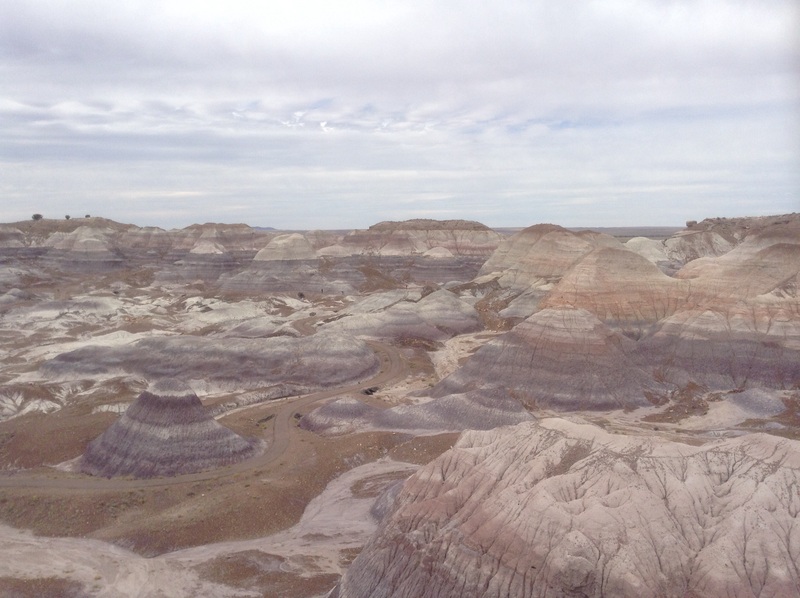 We drove the twenty-eight mile route from the Petrified Forest Visitor Center to the Painted Desert Visitor Center and stopped along the way for short hikes among the ancient trees and colorful geological formations. Sometimes it felt like a stroll on another planet, the landscape was so strange and alien. 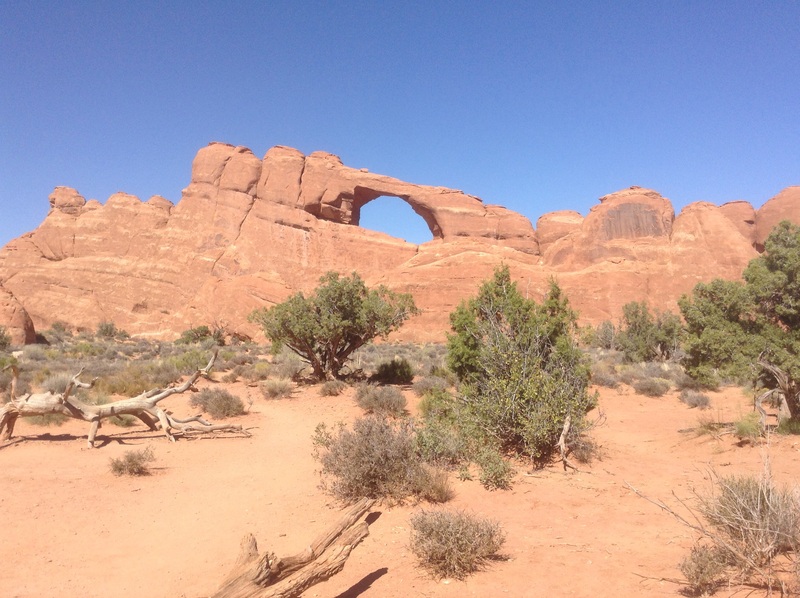 We visited Arches and Canyonlands in one day and that’s better than not seeing them at all, but it didn’t give us enough hiking time in either park. 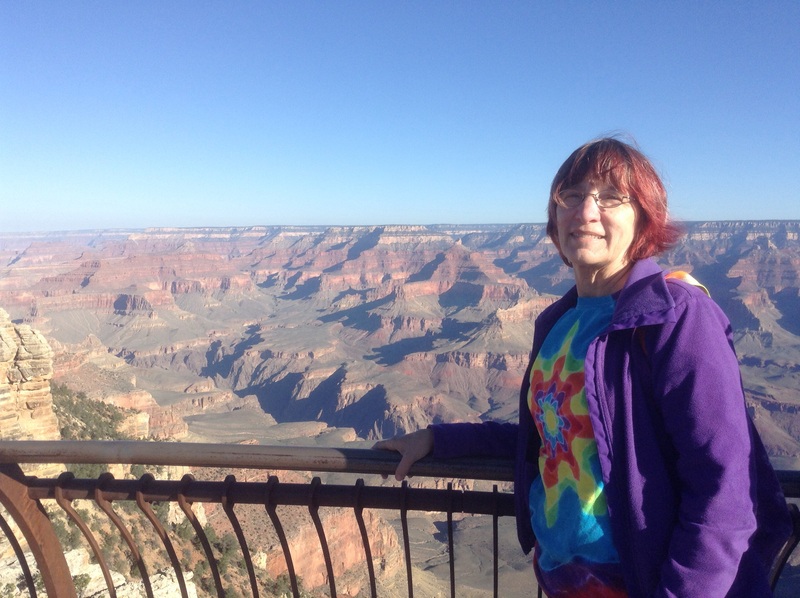 That was okay with me, actually – I had picked up a cold in the Grand Canyon and was happy to sit in the shade while my husband hiked the steeper trails. These parks were hot in September. The signs tell you to take plenty of water with you when you hit the trails and they are not kidding. The sights are worth the effort, even for someone with a cold, but no one should try the trails without a full water bottle. Maybe two. I’m telling you, it’s dry out there in Utah. Our last national park stop was at Mesa Verde in Colorado. This park protects cliff dwellings of the Ancestral Puebloans and is the largest archeological preserve in the United States. They offer a number of guided tours of the many cliff dwelling sites, but only one of them operates after Labor Day, so that’s why we ended up touring Balcony House. 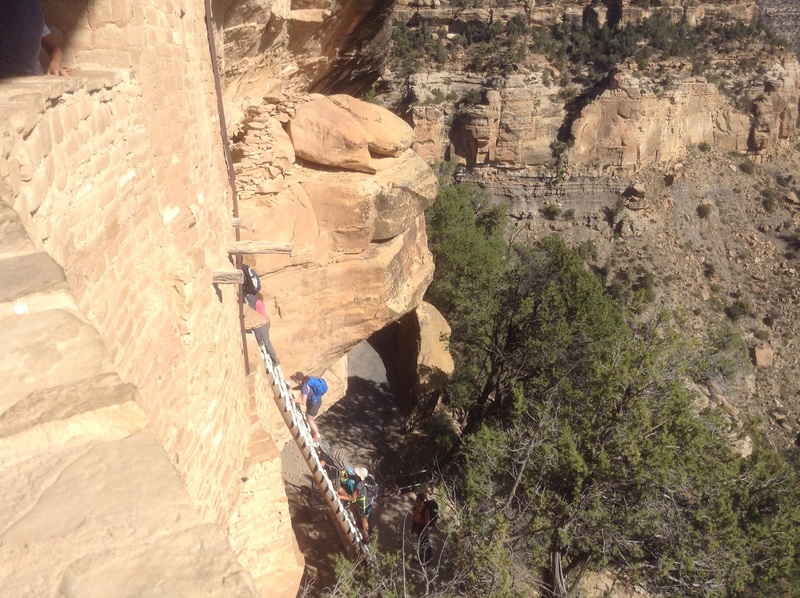 It was amazing, but it required all of us to climb a thirty-two foot ladder that was attached to the cliff wall. Firmly attached, mind you – perfectly safe, but it sure felt scary as I was climbing it. Yes, I climbed this ladder. Now I’m pretty sure I can do anything. 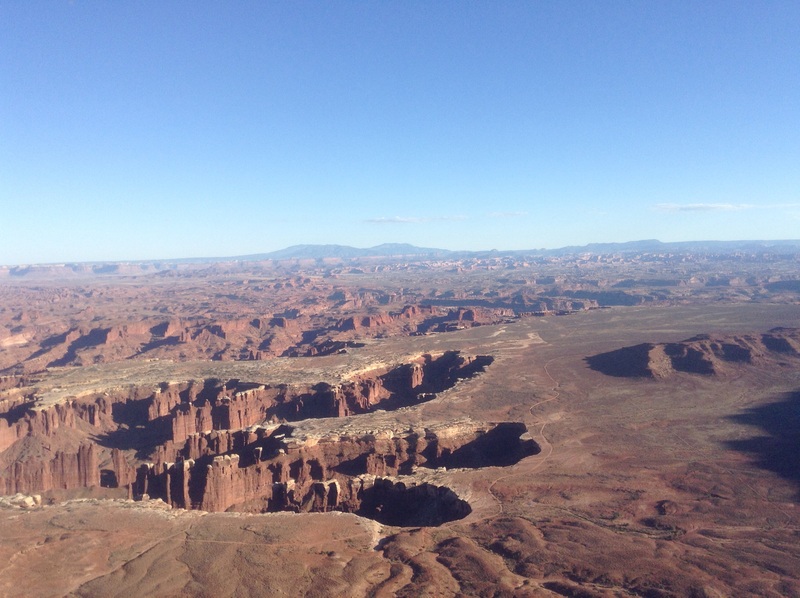 This entry was posted in Uncategorized and tagged arches National Park, Canyonlands National Park, Grand Canyon National Park, Mesa Verde National Park, the petrified Forest National Park on October 7, 2015 by releaf1954.